Our Ulthera Treatment is a non-surgical facelift procedure that uses ultrasound energy to lift and tighten the skin naturally. An added benefit of our non-surgical facelift is it has no post-treatment downtime. In addition, Ultherapy is a once only treatment procedure and the results mimic a more natural looking facelift. What device is used for a non-surgical facelift at our Geelong clinic? Our Ultherapy treatment uses an ultrasound device that uses energy to lift and tighten the skin naturally without surgery or downtime. The device is also used for ultrasound imaging, which allows us to see the layers of tissue we are treating, ensuring the treatment energy is delivered to where it will be most beneficial. Ultherapy is also designed to target aging concerns of the décolletage by improving the appearance of the lines and wrinkles within this area. In this video, Niamh explains how the Ulthera treatment works and how she keeps the results looking natural on our patient Lisa. She then also shows what’s involved in the preparation of the treatment and explains how she reads the ultrasound results to see which areas to target and which to avoid. How much does a non-surgical facelift cost at CRC Geelong? Before the treatment, you will have a consultation with Niamh, to discuss the procedure and the areas that should be treated. In this photo, we can see a dramatic difference in the definition of the patient’s neck and chin. These results were achieved after just 1 ulthera treatment! 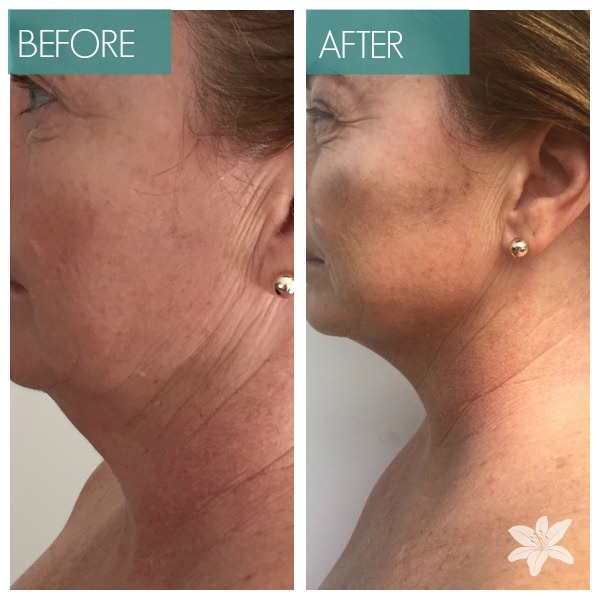 Who performs this non-surgical facelift in Geelong? Niamh is a plastic surgeon and has had more than 27 years medical experience and has been performing non-surgical facial rejuvenation techniques for almost 14 years. At CRC, we believe that having a doctor perform our Ultherapy treatment reduces the potential risks and side effects of the treatment.